The USS PALAU, a class Commencement Bay aircraft carrier was launched on August 6, 1945, receiving his first commission in January 1946 when he had to collaborate on tasks related to war demobilization. After this first allocation the ship remained on his home port in Norfolk until May 1947, when after making training maneuvers in the Caribbean, embarked on a journey through South America and Africa, and later assisted in an operation in the Mediterranean under an agreement with Turkey. Upon his return to the east coast of the United States in November 1949 would be assigned to a scientific expedition in the Caribbean that involved the launch of several "Skyhook" stratospheric balloons from the deck of the ship, sailing in an area southeast of the Jamaica strait. The aim of the expedition was to conduct studies on cosmic rays for several universities od the United States. 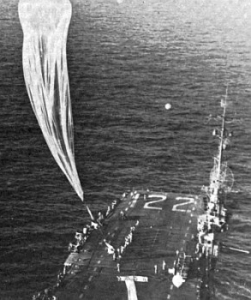 The balloon operations were under supervision of General Mills Inc. and was a continuation of other similar that had been done earlier that year in the same area, but using other carrier: the USS Saipan. That was the only involvement of the ship in balloon operations. After that, the Palau remained operating between the Caribbean and the east coast of the United States until 1952 when took part of an operation in the Mediterranean sea with the 6th Fleet. In 1953 while it was being considered its withdrawal from the active service the ship made one last trip to transport planes to Yokosuka, Japan. It was finally decomissioned in June 1954 and in July 1960 was sold to a scrapping firm in New York.